← Autism Spectrum Disorders from A to Z: Assessment, Diagnosis… & More! 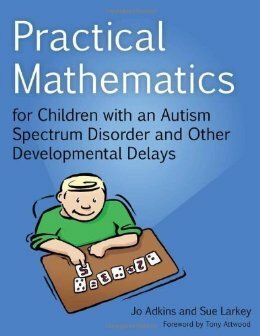 Practical Mathematics for Children With an Autism Spectrum Disorder and Other Developmental Delays by Jo Adkins. The authors emphasize the importance of incorporating a child’s special interest into learning in order to help them engage fully with new concepts. Topics covered include: colors, shapes, categories, numerals, sequencing, addition and subtraction and using money, and the book includes worksheets and activities for incorporating mathematics into daily living skills. This is an essential resource for teachers, teaching assistants and parents who wish to develop mathematics skills in children with an autism spectrum disorder and other developmental delays. This entry was posted in Education, Our Library and tagged Autism Spectrum Disorder, books, Education. Bookmark the permalink.